We’ve tried nearly every combination of board construction available from the average custom board builder -from standard polyurethane to Biofoam, Ice Nine, and EPS. Each material has its merits and drawbacks and each has its place depending on how you want your board to perform. Over the past couple years I’ve been dialing in a series of 6’4″ stringer-less boards made from EPS foam and glassed with 4 layers of glass on the deck. The principle is simple, remove the stringer and its associated weight, go with a lighter EPS core, and put all of the weight into the exterior glassing. My latest board has double the glass of a comp weight polyurethane board yet weighs the same if not less. The benefit of this construction method is that you get a much more durable board with the same weight. The only drawback to this method is with that much glass on the board the flex patterns are totally different and require reworking the shape to compensate for the added glass. What this means in real-world terms is that the board needs to be thinner and more foiled out overall to allow for added flex. I have had tried four versions of the exact same board, all with nearly identical dimensions, but each with tweaks to the thickness and foil. It’s amazing how by holding all the variables the same except one you can really get a feel for how that one variable affects a boards’ performance. I’ve got one now that is a good baseline board at 6’4″ x 19 1/4″ x 2 1/8″. I could easily go another 2” shorter due to widening the board a bit to account for thinning it out so much. I’m going to keep this one for a while and see how it stands up in the long run. The only sign of wear is an impression under my front foot that seems to be typical of lightweight EPS boards. My rocketfish that I’ve had for over three years got a similar impression the first month I rode it and has remained the same depth for the past three years with no delaminating or cracking so I think it’s just a case of the foam compressing under the heels. I can live with that if it means having a sub-6 pound board that lasts for over three years under heavy abuse. At first, when I envisioned writing a post about the stringer-less board it was going to be about the board and its construction. Since writing the above evaluation, it has really brought to light one of the key things we try and emphasize — the benefits of working with local custom board builders. Not only can you specify which foam and glass schedule you want, you can also work to refine your boards over a period of time. I think this has made the single biggest improvement in my surfing over the past five or so years, just having boards that are constantly refined and dialed in specifically for my height, weight and ability. If I had bought the first stringer-less board I tried off the rack in a surf shop I would have written the whole stringer-less thing off. 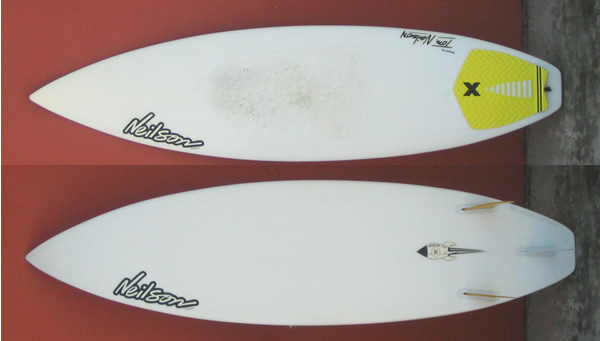 It rode well but not what I was looking for in a performance shortboard. By riding the board in a variety of conditions and going back and talking in depth with my shaper, in this case Tom Neilson, we were able to refine the shape to fit my height and weight and make small tweaks to the board to dial it in. After riding these boards for over two years now and surfing them in a variety of conditions I can say without a doubt that these are some of the best boards I’ve ever had. Extremely light weight, super durable (with ~16 oz. of glass on the deck), and the best part is they are available in custom shapes to suit individual surfers and styles. I have to give a huge shout out to Tom Neilson for putting the time and effort into these boards. p.s. Ricardo and I have decided to start signing our posts since we are starting to get more and more contributors to Phoresia and we want everyone to have a unique voice and be credited for their work and contributions. This looks like a really fun board!! i was wandering in the archives and found this—-i have an older eps/epoxy board that is stringerless and being 7 years old is still a wonder board! it was shaped by malcom campbell and laid up by clyde beatty—-very light and strong—-even after all this time it still has only a few dents in the deck and a bit of UV browning here and there—-i’ve retired it for a while while i play around with a Mako /resin research bonzer egg my local guy has build me……putting all the mass out on the skin of the form makes great sense—–point blanks with their super light cores and three/four layers of glass make unreal travel boards. I’m about to start shaping my first board with the help of a local shaper. He’s trying to convince me to go stringerless, we’ll be using an EPS core with some new type of glass that’s meant to be lighter and stronger. Previously he made me a perimeter stringer board out of similar materials which I absolutely adore so I’m inclined to trust his instincts. The shape I’m thinking about is a refactoring of my first shortboard which sadly is no more than a template at the moment. It’s a 6’6 x 20 3/4 x 2 5/8, wide swallow tail and lots of width right up to the nose. The wide point is slightly towards the tail. I was just wondering if you’ve got any advice for me on how to adjust this board for a stringerless design? The only real tweaks I’d suggest is to take maybe a 1/8-1/4″ out of the thickness and foil down the rails a bit more. Going stringerless you’ll want to add a bit more glass to strengthen it up and doing that stiffens things up as well so losing a bit of volume helps put some of the flex back into it. I think you’ll be stoked on the outcome though. Let us know how it goes!